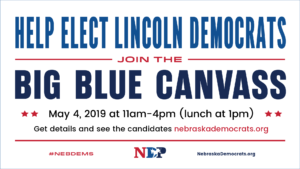 Come join us May 4 as we go canvassing for the critical May 7 Lincoln City Election. Block Captains from all over the state are encouraged to join us. We will do two shifts — one from 11 a.m.–1p.m. and then 2 p.m.–4p.m. Food will be served between both shifts at 1 p.m.